There are also major concerns about what academies actually teach. Beckett writes from a secular viewpoint, and is very sceptical about the involvement of the churches and evangelical groups in running schools. He states that there may be a democratic argument to be put forward in favour of handing schools over to religious organisations, but this has not been made. Instead, he cites quotes from Peter Vardy and the Roman Catholic spokesman for education in Scotland, McGrath, who regret that the churches have relinquished schools to the state. He shows how the churches, including the Church of England, are trying to get into education with the aim of indoctrinating a new generation of believers. Beckett isn’t entirely opposed to religious involvement in schooling. He has nothing against the traditional compromise, in which schools offered religious education and an act of daily worship, but were otherwise left to get on with things. But the religious character of some of these schools does become a problem, such as their refusal to employ staff of a different faith, or when most of their pupils are non-Christians, such as Muslims. Or when the Christian ethos is expected to get down into lessons like pottery. Peter Vardy and his organisation are a matter of considerable concern, because of Vardy’s determination to teach Creationism as an acceptable scientific theory, which has been criticised by the Royal Society, amongst others. It is not just the religious organisations that present problems with the subjects taught at academies. Sponsors are also able to set the curriculum, and so this reflects the particular interests of the businessman or organisation sponsoring the academy. In academies run by particular firms, the emphasis may be on those skills the firm requires, even though several of them have denied that they are in fact doing so. Beckett makes the point that these firms are effectively training ‘the worker bees of industry’ for tomorrow. Where the sponsor is a sports club, the academy, naturally enough, specialises in sport. The result is that subjects like technology and business are favourite subjects with sponsors, but ordinary, valuable subjects like English, Maths and languages, for which there is also a need, are much less well represented. Beckett also describes how academies also work to drive down the other schools in their areas. Academies may received massive funding from government – like £37 million – while something like £2 – £6 million may be granted to maintain the other state schools in the area. Academies thus may become the favoured choice for parents. They are also highly selective. There is evidence that very many of the academies expel difficult pupils, thus passing them on to the conventional state sector. Many of them also opt to select 10 per cent of their intake according to ability. Or they may choose to take them by banding. In this instance, children are divided into three bands of above average, average, and below average educational performance/ capacity. Schools following this method of selection take equal numbers of all the above bands. However, as academies were designed to raise standards in areas where there may be considerable deprivation, the lowest bands may fill up very rapidly, because of the way poverty brings down educational performance and expectations. So the new academy doesn’t take on all the ‘failing’ pupils in its deprived areas. Several of the academies in deprived inner cities targeted not local parents, but those further out in the leafy suburbs, who could be expected to be more affluent and send brighter, more capable pupils to their schools. And some of the schools that were declared ‘failing’, and slated to be turned into academies, actually were performing very well under circumstances over which they had no control. One of these schools, for example, was in an area where there was a large number of refugee children, none of whom were fluent in English. This school, however, had high staff morale, and provided value for money in the considerable improvement it made on these children’s grades from a very low base. This was before ‘value’ was taken into consideration, however, and Blair and his minions decided that the school wasn’t performing well enough. It is also very unclear whether academies provide any value for money or improvement over conventional state schools. Beckett presents a number of stats, which show that at one time, 11 out of 14 academies were in the bottom 200 schools. Where they did improve, it was quite often through transferring the less academically able pupils from GCSEs to GNVQs, which count as four GCSEs in the stats. When this is accounted for, the supposed superior performance of academies simply vanishes. And some of the improvements are simply achieved because vast sums of money were thrown at a failing school. Any school would have improved under these circumstances, and it’s a good question whether these schools would have improved more, if they had been under proper LEA control. 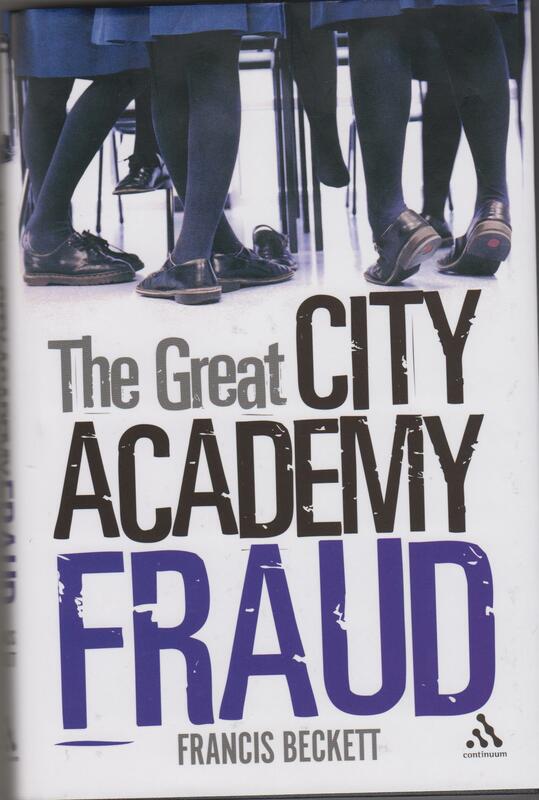 One of the book’s chapters is on the individuals, that Tony Blair took on board to sponsor the academies. As with so much of Blairite New Labour, there was more than a whiff of corruption about this. Money changed hands, so that sponsors could get a seat in the House of Lords or some other honour. One member of the department dealing with setting up the academies found the full force of the law, when he was caught in a sting operation by the Sunday Times. He had supposedly offered a lady journalist, posing as potential sponsor, the possibility of various honours. He was then arrested at 7.30 in the morning, and flung in jail on potential corruption charges, his career in government at an end. Meanwhile, the Blairite spin machine went into overdrive, with various Blairites, including David Miliband, declaring that no such sale was taking place. But politics was deeply involved, as many of those sponsoring academies had made generous donations and loans to the Labour party. Several of these were under investigation by the rozzers. The big news in science this week as far as this country goes, was Tim Peake’s blast-off yesterday to join the crew of the International Space Station. He’s the first Brit to travel into space for nearly twenty years. Helen Sharman in the 1990s was the first Briton to go into space in a privately-funded mission in Russia. Unfortunately, the private funding didn’t appear, and she only flew thanks to the generosity of the Russian government. Towards the end of the decade, Tim Foale also flew aboard the Space Shuttle. He was not, however, technically British, as in order to participate in American shuttle programme, he’d had to take American nationality. The launch was covered by the Beeb in their Stargazing Live programme, and there was a countdown to the launch, featuring various Beeb celebs and personalities. Down here in Bristol, even the local news programme, Points West, got in on the act. Their anchor David Garmston interviewed an Asian lady, an astrophysicist working as the education director for the @Bristol Science Centre. She had joined the competition to become the first British astronaut for over a decade, and had reached the final six before sadly being rejected. She graciously said that the better person had won, and wished Peake all the best. In fact, long before Helen Sharman, Foale and Peake voyaged into the Final Frontier, from the 1950s to the 1970s Britain was manufacturing and experimenting with space vehicles as easily the third space power apart from America and the USSR. The rockets launched by Britain, many of them from the Woomera launch city in Australia, were the Skylark, Skua and Jaguar sounding rockets, the Blue Streak missile, Black Arrow and Black Knight. There was also a projected larger launcher, Black Prince. These rockets were developed at the suggestion of the Gassiot Committee of the Royal Society, which in the 1950s became interested in using rockets to study Earth’s upper atmosphere. The committee invited members of the Ministry of Supply to their 1953 conference on the subject, and the result was that they were contacted by the British government to see if there would be any interest in developing such a vehicle. And from this came the Skylark programme. These rockets were 25 feet long and 17.4 inches in diameter. They were built by the Royal Aircraft Establishment at Farnborough and the Rocket Propulsion Establishment, Westcott, which made the Raven solid rocket motor which powered it. The first Skylark rocket was launched from Woomera in 1957. By 1965 over 100 such rockets had been launched. The rocket was modified, and the Raven motor replaced by the more efficient Cuckoo, so that it could lift a payload of 330 pounds 136 miles into space. The rocket has been used to study wind, the temperature of the upper atmosphere, the ionosphere, radiation and micro-meteorites. This is another sounding rocket used to study the atmosphere. It was 8 feet long, 80 pounds in weight, but could carry a payload of 11 pound 46 miles into the atmosphere. Like today’s hobby rockets, it was re-usable, coming back to Earth via parachute, so that it could be given another load of charge and used again. A second variant of the rocket, Skua 2, could take the same payload up to 62 miles. The rocket was built by Bristol Aerojet, and was launched from a 32 foot long tube mounted on a Bedford truck. This was developed to research the problems of aerodynamics and heating in hypersonic flight. It was a three stage rocket developed by the Aerodynamics Department of the Royal Aircraft Establishment in Farnborough, and the Aerodynamics Division of the Weapons Research Establishment in Australia. The rocket motors for the vehicle were produced by the Rocket Propulsion Establishment at Westcott. The first stage was powered by a Rook motor, which takes the rocket to 80,000 ft. The second stage Gosling motor is fired, which increases the rocket’s speed from 3,000 ft/s to 5,500 ft/s. After this is used up, the final stage Lobster motor accelerates the rocket to 10,000 ft/s. It was capable of taking 20 pounds to an altitude of 500-600 miles. This was developed as the test vehicle for Blue Streak, an independent nuclear missile launcher. Blue Streak was abandoned in 1960, partly because they wouldn’t be anywhere in Britain suitable to launch it from in the event of a nuclear attack. Black Knight, however, continued to be developed as rocket for scientific research. It was used for a further five years to study problems in re-entry, the upper atmosphere and carry experiments later incorporated into UK and US joint scientific satellites. The rocket came in single and two-stage versions. The single stage version was powered by a Gamma 201 liquid rocket motor burning a mixture of High Test Peroxide and Kerosene. It was 32 ft 10 in. in length, and three feet in diameter. The rocket could reach a maximum height of 147 missiles. The rocket motor was produced by Armstrong Siddeley, and based on an existing Gamma motor developed by the RPD at Westcott. The two-stage version of the rocket were flown from August 1964 to 25th November 1965. It was 38 ft 8 in. in length. The first stage rocket motor was powered by a Gamma 301 engine, and then by a Gamma 304, developed by Bristol Siddeley. The second stage was powered by a version of the Skylark’s Cuckoo motor, and was three feet long and 1.4 feet in diameter. It was fire back into the atmosphere so that the effect of the re-entry speeds could be studied. A larger version of Black Knight using Gamma 303/4 motors in a vehicle 54 in. in diameter was under development in Bristol in 1963. There was also a plan to build a three stage rocket, Black Prince. This was to use Blue Streak as its first stage, a 54 inch Black Knight as the second stage and then a small, solid rocket third stage. The rocket would be 97 ft 10 in. tall, and be able to send 1,750 pound satellite into polar orbit 300 miles above the Earth. Between September 1958 and November 1965 22 Black Knight rockets were launched from Woomera. Saunders Roe on the Isle of Wight were responsible for the rocket’s overall design, construction and testing. Armstrong Siddeley of Ansty, near Coventry, were responsible for the rocket engine, and De Havilland of Hatfield were to supply the test team at Woomera. The rockets were subjected to systems checks at Highdown on the Isle of Wight, before being flown or shipped out to Woomera. BK 10, the spare for the rocket BK 11, was returned to Britain, and donated to the Science Museum, while High Down is now the property the National Trust. 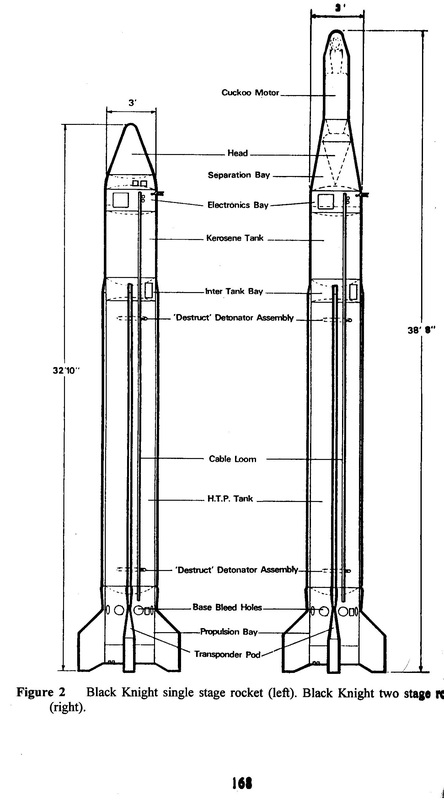 Although it was cancelled as an independent nuclear weapon, there was an attempt to salvage it by using it as the proposed first stage for the proposed European rocket launcher, Europa 1. It was built by Hawker-Siddeley Dynamics and Rolls Royce. It had a Rolls Royce RZ-2 engine, burning a mixture of kerosene and liquid oxygen to produce 300,000 pounds of thrust. Unfortunately, this also came to nothing as the European rocket launcher project was cancelled due to the failures of our European partners to produce effective, functioning second and third stages. After the cancellation of the Black Knight programme, Britain continued developing its own independent satellite launcher. This was Black Arrow, a three stage rocket standing 42 feet 9 inches tall. The main contractor for the spacecraft was Westland Aircraft, which was famous in the West Country for manufacturing helicopters. The first stage was powered by a Rolls-Royce Gamma Type 8 engine, burning hydrogen peroxide and kerosene. The second used a Rolls-Royce Gamma Type 2 engine, while the third was powered by a solid propellant rocket, Waxwing, made by Bristol Aerojet. Sadly, the project was cancelled after it successfully launched the 220 pound Prospero satellite into a 300 mile polar orbit in November 1971. These projects were cancelled and the accumulated knowledge effectively thrown away, because the mandarins at the British Civil Service saw no value in them. They were considered too expensive, and it was believed that using American rocket launchers would be a cheaper and more cost-effective option. In fact Britain has lost out because, at least in the 1990s, it looked as if there was going to be an international market in space vehicles. Even the Indians were developing them. The launch of British satellites by the Americans meant that Britain depended on their goodwill and available space aboard their rockets. The French, who I believe were responsible for the second stage of Europa I, the European rocket launcher, forged ahead to produce the cheap and successful Ariane, launched from their site in Kourou, French Guiana. The French rocket is actually cheaper, and more economical, than the Space Shuttle. The Shuttle, however, had the advantage in that it was heavily subsidised by the American government. It’s therefore ironic that David Cameron should try to show the world how keenly he is supporting a British astronaut, when this is precisely what British governments have failed to do since the 1970s. Maggie Thatcher was all for Helen Sharman’s voyage into space, as that was supposed to be managed by private enterprise. Until private enterprise wasn’t able to do the job. Cameron’s government has carried on this daft and destructive policy of closing down Britain’s manufacturing base, and preferring to buy in from outside rather than develop our own industries. Way back in the 1960s Harold Wilson made a speech about Britain benefiting from the ‘white heat of technology’. Those in power never listened to him, and despite Cameron mugging on Twitter, they still aren’t. You can see that from the way they’ve sold off our industries, including the defence contractors that were able to create such magnificent machines as Black Arrow. And our country is much the poorer. John Becklake, ‘British Rocket Experiments in the Late 1950s/Early 1960s in John Becklake, ed., History of Rocketry and Astronautics (San Diego: American Astronautical Society 1995) 153-64. John Becklake, ‘The British Black Knight Rocket’, op. cit. 165-81. T.M. Wilding-White, Janes Pocket Book : Space Exploration. In this clip below, Alice Roberts from the Beeb’s Coast TV series, interviews members of the Black Arrow team on the Isle of Wight. One of them tells her how he was told to tell the rest of the team the project was cancelled and they were sacked immediately after the launch. Hansard, the parliamentary newspaper, records that the mandarin, who made the decision did so because he could see absolutely no future in the development of satellite launchers. Here’s a British newsreel report on the Blue Streak programme from 1964. 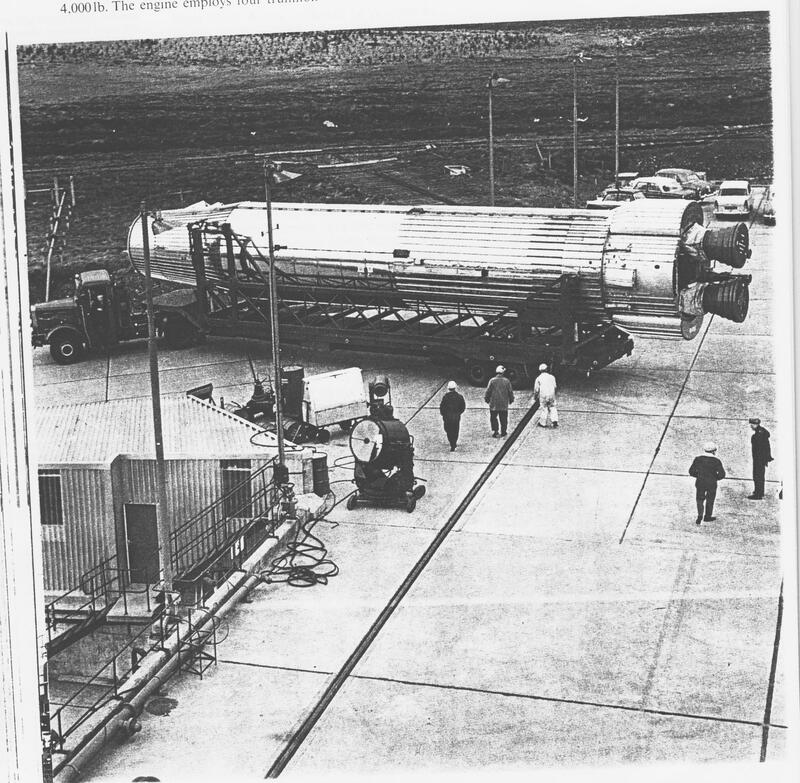 It shows the rocket being tested at Spadeadam in Scotland, and its launch in Woomera. It talks about the European Rocket Launcher programme, and some of the dignitaries attending the launch, such as the French general in charge of the European project. It also shows what a thriving community Woomera was back then, and follows Mrs Lawrence, a housewife with a part-time job as a camera operator tracking the rocket on its launch, as she goes on her 300 mile commute each day from home to the launch site. It recalls the era as one of optimism, of a time when Australia itself, its rugged landscape and sheer vastness, were a source of fascination and wonder to Brits, long before the arrival of soap and pop stars like Kylie Minogue. For many people, the trial of Galileo demonstrates the medieval Roman Catholic Church’s hostility to science, and has become part of the view that somehow religion is intrinsically opposed to scientific investigation and progress. Yet historians of science, from Pierre Duhem, A.C. Crombie and James Hallam have noted how the medieval church had an active interest in science, and that many of the achievements of the Scientific Revolution of the 17th century were actually solidly based on those of their medieval predecessors. Some sections of the Church defended Galileo, such as the friar, Thomas Campanella. Historians have also pointed out that the trial was not simply about the science itself. One important factor was Galileo’s highly critical tone towards the Aristotelians, which included the then Pope. Another factor was that at the time the heliocentric system was underdetermined – it lacked the scientific evidence to make an absolutely convincing, watertight case. Roman Catholicism was also not alone in rejecting the new, experimental science. The 16th century Lutheran Church in Germany still remained strongly Aristotelian in its scientific philosophy, and part of it continued to reject the heliocentric theory until the 18th century. ‘The Church of Rome has indeed of late look’d more favourably upon it (experimental knowledge). They will now condemn no man for asserting the Antipodes: The severity with which they handled Galileo, seems now very much abated: they now permit their Jesuits to bestow some labours upon natural observations, for which they have great advantages by their travails; and their clergy may justly claim some share in the honour, as long as the immortal names of Mersennus and Gassendus (Mersenne and Pierre Gassendi) shall live’. The Jesuit Order was particularly active scientifically. In his Spiritual Exercises, Ignatius de Loyola, the Order’s founder, urged his followers to contemplate God as the Creator of the natural world, whose activity sustained it and caused it to operate. Point 2 of the ‘Contemplation for Obtaining Love’ in the fourth week of the Exercises commands the reader to ‘consider how God dwells in the creatures: in the elements, giving them being; in the plants, giving them growth: in the animals giving them sensation: in men, giving them understanding’. Point 3 further advises the reader to ‘consider how God works and labours on my behalf in all created things … as in the heavens, elements, plants, fruits, flocks’. The Roman Catholic Church of the Middle Ages and 16th and 17th century was thus certainly not as hostile to science as those who consider religious faith to be opposed to science believe. Despite the trial of Galileo, some Protestant scientists, such as Sprat, recognised the Church’s positive attitude to science in their time, and readily praised the achievements of Catholic scientists.